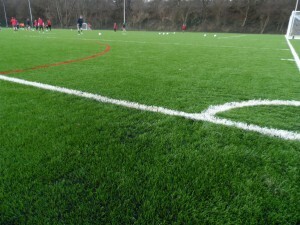 The most professional and top quality artificial grass sports pitches are compiled of plastic grass fibres and an infill which is made up of either a combination of sand a rubber crumb or just sand on its own, this infill helps to keep the fibres upright and provide good playing characteristics. As a result of the development of artificial grass technology, new 3G grass pitches have much softer plastic fibres, this means that the sand and rubber infill needs to be regularly checked to ensure that the quality is maintained. We can provide all the advice an information you need on this process so don’t hesitate to get in touch with our team by completing our quick contact form. If you don’t regularly clean and maintain your artificial turf sports surface, it can start to develop problems. One major problem which can occur is compaction, this happens when the rubber crumb infill particles get squashed down into the grass and it can lead to a loss of performance characteristics and poor drainage causing the pitch to become waterlogged and unsafe. It is vital to carry out rubber infill maintenance on a 3G pitch by using a drag brush to spread the rubber crumb around through the grass fibres to prevent them from becoming compacted. You can also maintain your artificial sports surface with moss and algae treatments to get rid of and debris, as well as repairing damaged or worn out areas as quickly as possible before they get worse or become contaminated. After around 1-2 years, it is recommended that you have the rubber infill in your sports pitch topped up to ensure that it stays in the best possible conditions and to maximise the durability and longevity of your facility. This will make sure that the synthetic grass surface provides the best performance and safety characteristics for the players, as well as preventing water build up and flooding on the pitch. It is also highly recommended that your have your synthetic sports surface tested annually to make sure that it is in the best condition and to pick up on any potential problems and tackle them before they get worse. These sports surfacing tests could include anti slip tests, ball roll and bounce assessments, impact absorbency testing and porosity tests. Carrying out these assessments can ensure that your sports facility meets the correct accreditations for the relevant sports governing bodies, and that the pitch gives the best playing characteristics for those who use it. Soft Surfaces Ltd are a specialist company in the installation and maintenance of sports surfacing, we can assist you with all of your sports surfacing requirements, whether it be a simple rubber infill maintenance job or an entire full sized pitch construction. Our experienced team will be on hand to help you through every aspect of your project, we can also provide you with financial help through a funding grant so please check the funding grants search tool to see if your organisation is eligible. If you would like more information about sports pitch maintenance or any other sports surfacing projects, please visit our website at https://www.sportsandsafetysurfaces.co.uk/. To discuss an enquiry and receive a quote for your project, please fill in our contact form and we will be able to discuss costs and prices to suit your individual budget. If you found this information helpful please share it and if you have a question don’t hesitate to leave a comment below!